Women want him, nanoprobes fear him. The book of the month for this month's Christian Science Fiction/Fantasy Blog Tour is Double Vision by Randy Ingermanson, which features the story of an autistic savant computer programmer...and the women who love him. 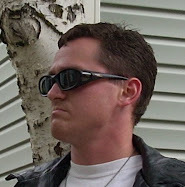 Our feature blog is that of the author, Randy Ingermanson, physicist and Christian sf novelist. I got a little scared when I went looking at his blog and found he had a section on the so-called Bible Code. I was gearing up to write an article flaming him, but after going through his information, I figured I'd better hold back. Everyone relax: Ingermanson is not a supporter of the Bible Code. In fact, he has some good summaries of why you shouldn't believe in it. His article on prophecies in the alleged codes is quite good. The article on proximity has more meat to it. The one on bias is excellent. I'll admit, looking at his stuff on the Bible Code makes me want to read Ingermanson's books. He is succeeding here at making statistical issues digestible and interesting, though, granted, he's not actually bombarding me with the statistics. Here's a brief reflection: The Bible Code, Ingermanson tells us, was first proposed by mathematicians. And the moral of the story is: Even scientists make mistakes. There have been other funny claims about the Bible. I once ran into a book, I think by a mathematician, who argued that the verse and chapter numbers in the Bible were a secret cataloguing system for themes. In other words, all the verses on "love" would appear at or near the same chapter and verse in each book. (Ingermanson discusses "wiggle room" in his articles on the Bible Code and that no doubt explains this phenomenon.) Even to the non-statistician, some problems with such a proposal are immediately obvious: first, the Bible repeats a lot of themes so such coincidences are unsurprising; second, no theologian I've ever heard of claims the chapter and verse numbers are inspired; third, you can probably force the theme you want into a verse if you're intent on finding it there; and fourth, not all Bibles have exactly the same chapter and verse numbers. Again, I know of mathematicians quite impressed by the numbers of people and objects in the book of Numbers, and some have apparently argued that the numbers are quite complex, supposedly too complex for ancient peoples to have produced without guidance from God. News flash: Ancient people could add correctly even without calculators. If you don't believe me, go see how those ingenious New Kingdom Egyptian scribes approximated the volume of a round silo without using pi. They didn't have calculus or that stuff, but they knew what they were doing. I also once read a theory that the supposed face discovered on Mars had latitude and longitude coordinates in some way related to pi, indicating the face was placed by aliens. I guess you really can "prove" anything with numbers if you try hard enough and have a good enough imagination. There's also a claim that the ancient Babylonian Enuma Elish is really a description of planets colliding and aliens manufacturing the human race a la Lovecraft. If you want to read something weird into an ancient text, you can do it. And I've also heard that Elvis is still alive. Are you ready for a blog tour?? ?